Speed: 3 Forward & 1 Reverse; Operating Weight: 278 lbs. 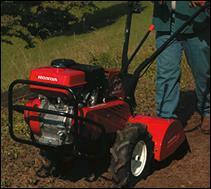 * Please call us with any questions about our tiller 8hp honda self prop. med duty rentals in Sacramento and Citrus Heights, serving Auburn, Placerville, Woodland, Davis, and Elk Grove in the Sacramento area.